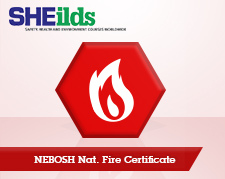 SHEilds – Health, Safety and Environmental e-Learning – For Fire Service personnel only, claim a 40% discount off NEBOSH eLearning courses; including Certificates in Fire Safety and Risk Management. Study online to become a qualified health and safety professional with the world’s leading HSE training centre and develop a variety of career benefits. Examination registration and sitting fees apply.